Light golden color. Tasting notes of honey, toasted oak, cinnamon, vanilla, and caramelized banana. A balanced, richly flavored, medium-bodied rum, with an enduring finish of candied vanilla bean that lasts long in the mouth. Interesting rum, welcoming as a sipper and a must for serious mixologists seeking a Mexican-Caribbean twist on tradition. Just like their tequila, Mexicans are culturally known for their zest and intensity, which in turn, makes their global influence undeniable. Mexico’s Yucatán Peninsula is famous for beautiful beaches, Mayan ruins, as well as fabulous resorts. Most of the Yucatán Peninsula’s tourism is condensed in the Mexican states of Yucatán and Quintana Roo. The northwest coast of Yucatán is Mérida, where the Casa D’Aristi rum-producing family is based. Casa D’Aristi produces rum and rum-based exotic liqueurs at its home in the Yucatán Peninsula which was founded in 1935 by the Aristi family, with generations of dedicated family members and loyal employees devoting their lives to creating artisan spirits that uphold the traditions of the Mayan culture. Mérida has the highest percentage of indigenous persons of any large city in Mexico with approximately 60% of all inhabitants being of the Maya ethnicity. The ancient Mayan civilization reached the peak of its power and influence around the sixth century A.D. Although the Mayan Empire mysteriously collapsed, many of their present-day descendants continue to embrace the traditions, legends, and beliefs of their ancestors. 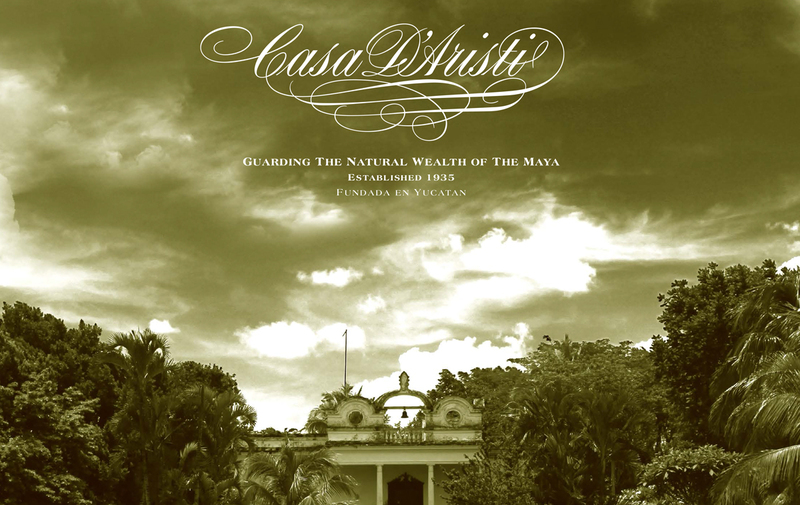 All of Casa D’Aristi products are made with 100% natural and regional quality products with most of the production process done by hand at the family’s historic Hacienda; Francisco Montejo founded the first Yucatán cane plantation in 1540 and built a processing mill on the plantation where the main house still stands today. Every day more than 30 artisans hand-fill and hand-finish every single bottle of Ron Caribe rum. Casa D’Aristi is known for their outstanding and unique Mayan liqueurs, and Ron Caribe rum is no exception. Made in Mexico, Ron Caribe’s name pays homage to the Caribbean coast. 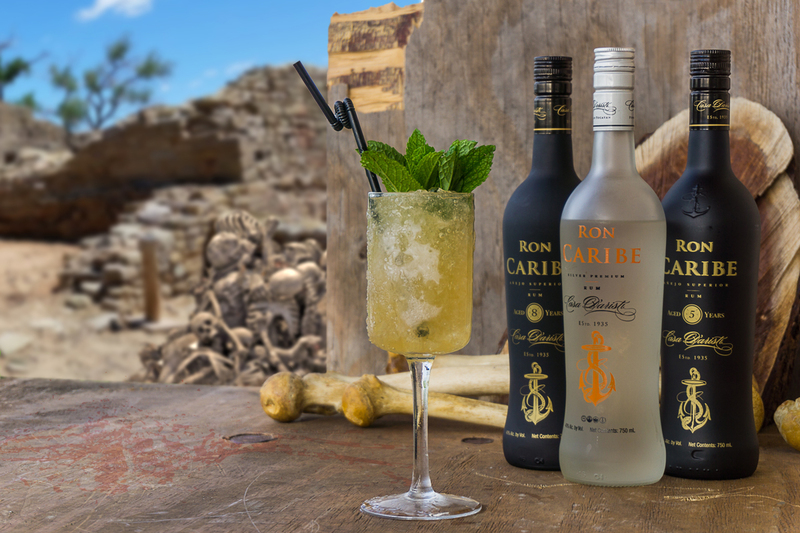 Given Yucatán’s sultry climate, Mexico produces some of the finest sugar cane in the world, and only the best is used to produce Ron Caribe rums. Traditionally, Mexico distills very light-bodied, light-flavored types of rum. However, the new Ron Caribe line extension adds a very interesting twist to the mix. Ron Caribe 5-year is aged in special American oak barrels previously used to store bourbon. For 5 years, the rum remains in the barrels aging so that when its ready to be enjoyed, it reveals its deep character. It presents chocolate, spice, vanilla and toasted oak flavors and provides a remarkably warm and mellow finish. It can be enjoyed neat as a sipping rum or over ice, however, we’ve found that its deep vanilla character lends to being mixed with stronger rums and exotic spices. 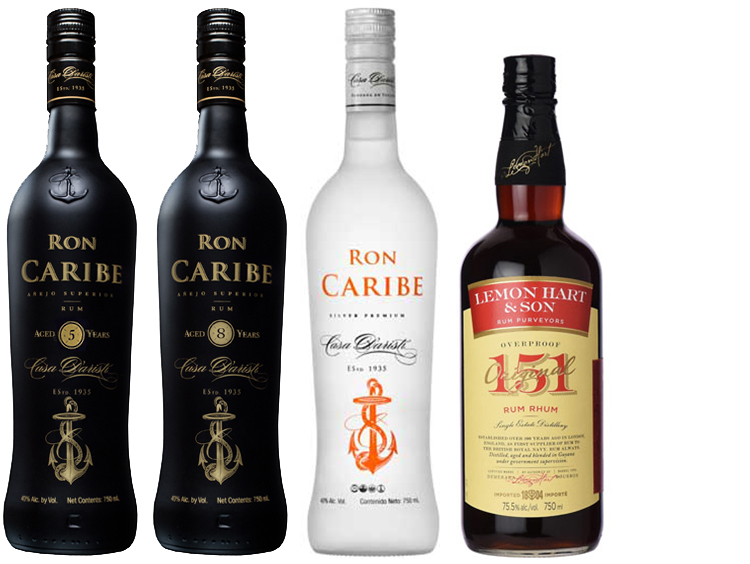 Ron Caribe 5-year rum with its distinctive vanilla and citrus notes is very mellow and smooth. 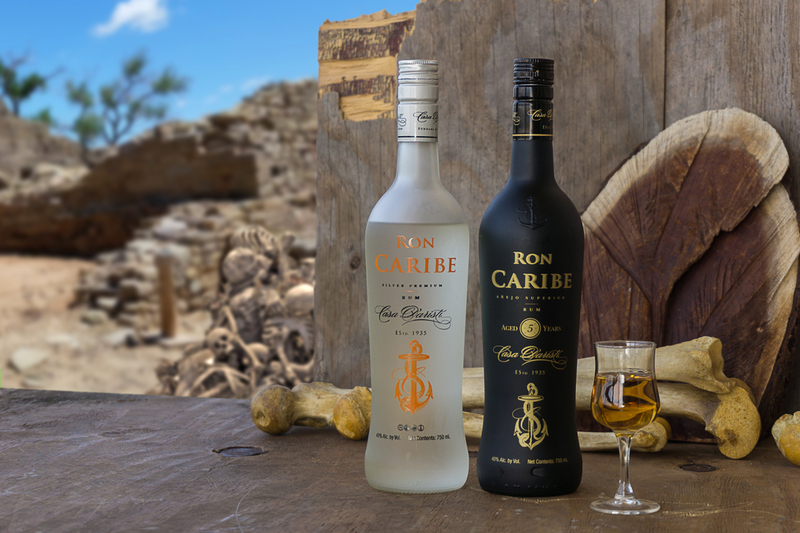 As with the rest of their portfolio of products, including Ron Caribe Sliver Premium (pictured above) and Ron Caribe 8-year rum (pictured below), all Ron Caribe rum is made from natural and quality ingredients, including pure vanilla from Vera Cruz. From the selection of the sugarcane down to the bottling, Casa D’Aristi cultivate their rum with passion and precision. 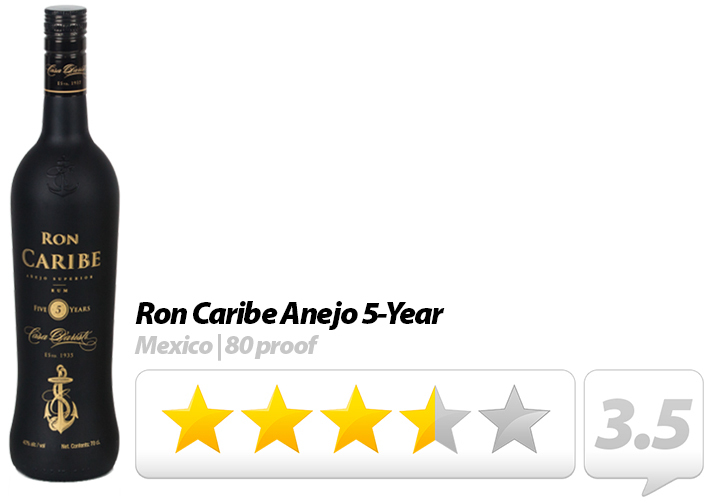 Ron Caribe 5-year is attractively packaged in a matt black bottle which adds some mystery and allure to the product. As the name ‘Caribe’ suggests, notions of authentic Caribbean rum with its claims to a rich heritage and vast range of styles is evoked. Casa D’Aristi have clearly approached their branding in a very conscious way and, taken all together, their current family of products reflects a growing diversity among rum’s much-needed premium brand building. 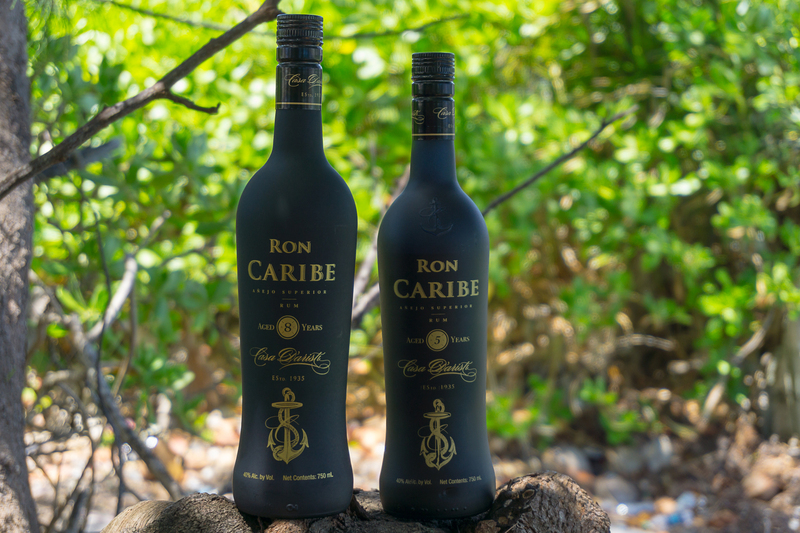 Ron Caribe’s distinctive matt black bottles add a sense of mystery and exoticism to the brand. In fact, given rum’s global spread, and all the differences in production techniques, it is even more surprising that rum is one of only two spirits categories to have seen growth in all major regions of the world, including Mexico. Thanks to the return of the cocktail culture and the rise of the educated consumer, there is a growing global audience who are thirsty for guidance and knowledge on quality products. Indeed, there has been an abundance of new product launches in the alcoholic drinks category, including an exciting new rum-based exotic liqueur line from Casa D’Artsti (which will be the subject of a later review) which is proving to be a key strategy for driving sales and growth in an ever competitive market. Method: Flash-blend with 1 cup of crushed ice for 3-5 seconds. Add additional ice if needed. Garnish with multiple fresh mint sprigs. Pour unstrained into a 12 oz champagne coup or goblet. With distinct notes of vanilla and buttery oak, this ‘swizzle-style’ cocktail achieves that pucker-up tartness that we all love. Start with very small sips and then gradually work your way up. The drink has a unique twang to it which underscores its robust alcoholic base. The 151-proof rum adds a varying layer of depth which really allows the Ron Caribe 5-year’s vanilla character to shine through. Best enjoyed on a warm summer’s day poolside! Tip: Make sure you use a sugar free vanilla syrup. This is what really makes the drink. If not, the balance of the drink will become too sweet. 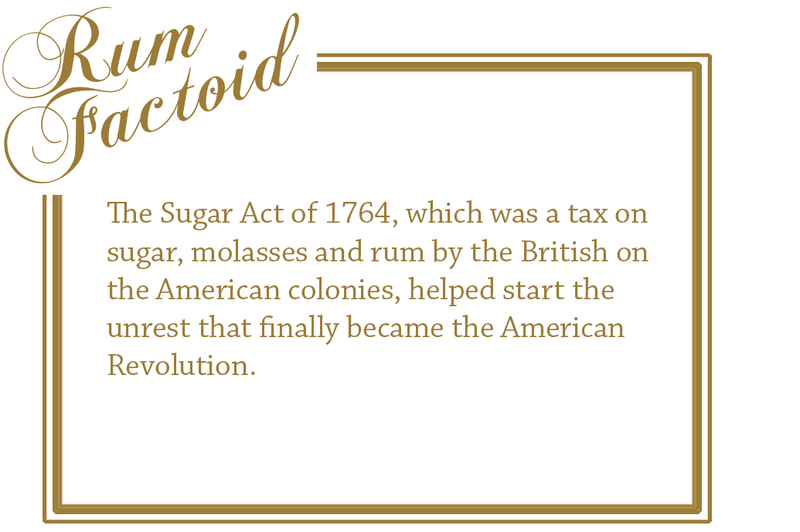 Typically we would use a regular vanilla syrup (such as BG Reynolds) but check your local grocery or coffee shop store for Torani or Café al Fresco sugar free line of syrups. WARNING: This concoction contains over 3 ounces of liquor, including 151-proof rum and alcoholic falernum. In fact, the only non-alcoholic components of the drink are the lime juice and vanilla syrup. 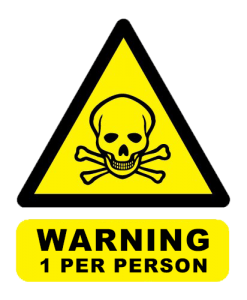 Drinker discretion is strongly advised. We recommend you limit the cocktail to one per-person.